Using chemicals or other hazardous substances at work can put people’s health at risk. So the law requires employers to control exposure to hazardous substances to prevent ill health. Spirometry is sometimes referred to as Respiratory Lung Function Surveillance which is carried out to comply with Control of Substances Hazardous to Health Regulations, 2002 (COSHH). Respiratory illnesses commonly cause sickness absence, unemployment, visits to the GP, disability and handicap. Collectively these disorders cause the loss of 38 million days per year. Employers have a duty to complete Risk Assessments to identify any hazardous or potentially hazardous substance that an employee may inhale whilst at work. Once a hazard has been identified, control measures need to be put in place in order to prevent ill health. Health surveillance compliments other preventative measures taken by a caring employer. Health surveillance is not to be used as an alternative to proper controls to exposure. Health surveillance involves collecting and using information about workers’ health relating to the substances they work with. This helps to prevent respiratory diseases from developing by detecting early symptoms. 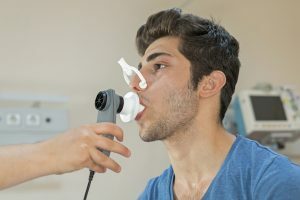 Spirometry will assess the lungs capability in exchanging gases and may detect early signs of lung damage such as occupational asthma or other respiratory diseases.